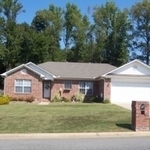 This house is an all brick 2005 build with a privacy fence. We spent a lot of time and money installing the garden in the front of the house and also added gutters all around. The house is on a cul-de-sac road so the only traffic is the neighbors, great for the kids to play. There are only 2 streets in the neighborhood and a large majority is military and retired persons, so it’s nice and quit. 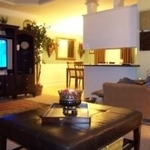 There is fast access to the major highway 67/167 and just 20 minutes to the base. Cabot, just 5 min. south, is a fast growing city with a sought after school district and many places to shop and eat. The traffic is also growing…Living in Ward allows for shopping and playing in Cabot without the hassle of the traffic. It is also within Cabot’s top school district boundaries. North Little Rock and downtown Little Rock are also just a short drive south on 67/167. THE INSIDE… Open split floor plan. Carpet throughout, tile floors in kitchen and bathrooms. LIVINGROOM: a large rectangle with crown molding, trey ceiling, ceiling fan, 2 large windows and cable connections on either side of the room. KITCHEN: wide open kitchen w/ dining room open to living room, you can even watch tv while cooking. Granite counters which we added, matching stainless steel dishwasher & fridge, built in microwave, new sink with faucet and a flat top stove. 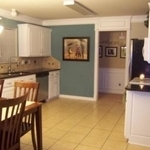 All kitchen appliances will stay w/house including fridge. 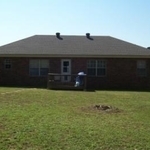 MASTER BR: large, trey ceilings, crown molding, ceiling fan with 2 big windows to the backyard. 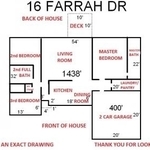 MASTER BATH : his/ her walk-in closets and sinks with a tub/shower. LAUNDRY: large, walk in room with option for food pantry. 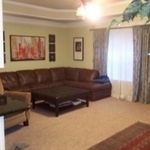 2 BEDROOMS: basic rooms with ceiling fans, closets and cable connections. 2ND BATH : full bath, for the kids with an additional storage closet. We are the 2nd owners of the house and it was our first home and it was absolutely the best house for the money, especially being first time buyers. We also had an alarm system installed and the police station is literally 2 minutes away. There are also storm doors on the front and back & the back has a dog door installed on the storm door.